Entering His Rest "you are worth more than Many sparrows." Jesus said, “Are not two sparrows sold for penny? Yet ‘not one of them will fall to the ground without the will of your Father’. And even the very hairs of your head are all numbered. So don’t be afraid; you are worth more than many sparrows”. (Matt 10: 29-30). What an incredible promise Jesus makes in these two verses. In Matthew Chapter 10 vs 1; Jesus calls his twelve disciples to himself and gives them authority to drive out evil spirits and to heal every disease and sickness. He forewarns them of the challenges ahead when ministering in His name. Jesus said to them, that if he Himself had been called Beelzebub, (Satan, father of lies) then His disciples would also suffer the same persecutions and accusations. It is truly beyond our human comprehension that amongst the many millions if not billions of Sparrows worldwide, our heavenly Father sees and knows each one of them, along with the very hairs upon our head even if we sometimes don’t have very many left! I too have personally experienced what Jesus forewarns His disciples with, but laying that aside I want to encourage you with my very own personal testimony of God’s love and provision that will stretch any preconceived ideas of what we might possibly think Gods provision should be. It would be natural to think that His provision for me was either a financial blessing or some other kind of humanity’s necessities, and yes they can be, but Gods provision for me was literally straight out of Matthew 10: vs 29. 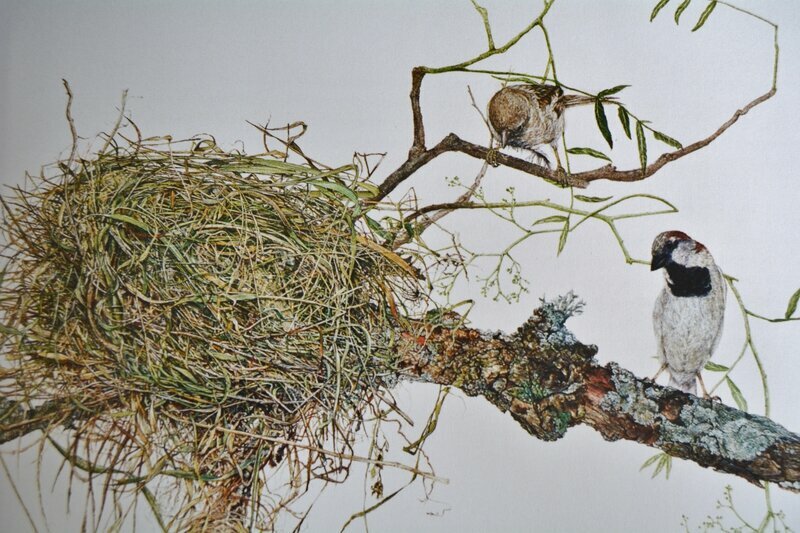 In 1978 my watercolour painting of “nesting sparrows” (above) was nearing completion. I had painted the male sparrow along with the nest, but I was needing to photograph a female one. After trying for most of the week to photograph one without success, I wondered how I was going to finish the painting. The following morning I left home to buy a loaf of bread, upon returning I noticed a small bundle laying in the centre of my driveway. I stopped the car and got out to see what it was, I was shocked; in fact I couldn’t believe it, it was a little dead female sparrow. I looked around to see if it had had an accident or something, but there wasn’t a mark on it and it was still warm from the life it had just had. As I picked it up I was reminded, that not one sparrow will fall to the ground without the will of the Father. I can remember looking up and saying, “Oh Lord you didn’t have to do that for me” I would have eventually photographed one. But beloved that’s how much He cares for us, and just like the millions if not billions of sparrows, He sees and knows each and every one of us. “Do not be afraid” are the words of Jesus to us, “you are worth more than these” (Sparrows). Jesus knew Saul was spiritually blinded, But their minds were blinded for until this very day at the reading of the old covenant the same veil remains un-lifted, because it is removed in Christ. (2 Corinthians 3: 14). Jesus supernaturally encountered Saul on the road to Damascus, heaven opened and a light so intense flashed all around Saul causing him to fall to the ground, Jesus said, “Saul! Why are you persecuting me? Who are you, Lord? Saul asked. And the voice replied, “I am Jesus, the one you are persecuting! Now get up and go into the city, and you will be told what you are to do”. (Acts 9:3-6). Picking himself up Saul could see nothing even though his eyes were open, the encounter had blinded him. The other men who were traveling with Saul heard the voice of Jesus but saw nothing; they proceeded to lead Saul onto Damascus. Saul was there for three days without sight, Jesus was removing his spiritual blindness, Saul had to wait the same time as it took Jesus to rise again (three days), before his new spiritual insight and sight could be restored through the Resurrection power of the cross which brings new life. In the meantime Jesus spoke to a prophet called Ananias to go and lay his hands on Saul so that he may regain his sight. Ananias questioned his assignment, he said; ‘Lord I have heard about this man Saul and what he has done to the saints at Jerusalem, but Jesus said Go, for I have chosen him to bear My name before the Gentiles and kings and the sons of Israel. Ananias stood before the one who had murdered and persecuted many of the saints., "Saul, Ananias said, Jesus has sent me to lay hands upon you so you will be healed" and immediately there fell from Saul’s eyes something like scales, (the past spiritual blindness) and Saul regained his new sight, he arose and was baptised and became a new creature in Christ. Therefore if any man is in Christ, he is a new creature, the old things passed away; behold new things have come (2 Corinthians 5: 17). The rest is history, Saul now known as the Apostle Paul became the greatest Apostle of all time. If Paul wrote the book of Hebrews then he would have written a total of fourteen books of the New Testament. As we journey on through these troubled and latter days, let us pray in unity for the end- time harvest of souls, let us be reminded of what Jesus is still able to do, He is still able to supernaturally encounter any man or women today just as He did for Saul. And I am in no doubt that He can change those who continue to persecute Christians and turn them into some of the greatest men and women for God for the coming end time harvest of Gods glory to be seen upon this earth. Jesus bought to us a new dimension of access to the Almighty Creator. Jesus called Him, Abba Father, Jesus took away the blindness that legalistic religion and sacrifices create, and reveals God through His own sacrifice upon the Cross, as Abba Father. Let us be reminded of Gods protection, e.g. the manna, the supernatural food of heaven, the rain of quail Gods provision for His people during their forty year journey in the desert testing (Exodus 16). The Cloud by day (Creation provision) their protection from the intense desert heat, (the shadow of God Almighty Himself). And at night His fire which kept them warm from the extreme cold of the desert nights that fell below zero. We are talking millions of people here, it is no wonder that Jesus tells us not to worry or be afraid, for His Word never changes, all Creation is subject to it, and all existence is bought into it. Commentaires sur Entering into His Rest "You are worth more than many Sparrows".